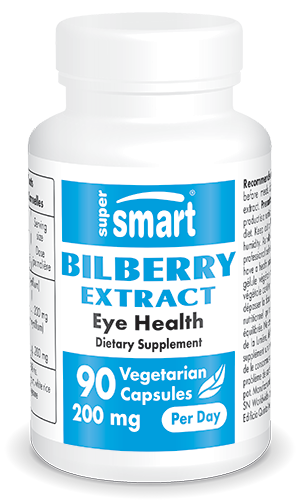 A number of studies have demonstrated the powerful antioxidant action of anthocyanosides in bilberry extract which has become one of the most widely-used supplements in the world for maintaining normal vision, improving micro circulation in the eye and for relieving tired eyes. Bilberry extract supplements (Vaccinium myrtillus fructus) improve night vision acuity and help speed up the eyes' ability to adapt to darkness and recover from dazzle. The antioxidant bioflavonoids (anthocyanosides) present in bilberry help the body to synthesise sufficient rhodopsin (a protein essential for night vision), protect ocular tissues from exposure to light (including television and computer screens!) and improve circulation in the microcapillaries which criss-cross the eye. Each vegetarian capsule contains 100 mg bilberry extract (vaccinium myrtillus) standardised to provide 25% anthocyanosides.